A Harlem, New York pastor warns black women about another reason why they can’t find a good, strong, black man: white gays who are moving into black neighborhoods due to gentrification. And black women, you can blame President Obama for unleashing this threat. Reverend James Manning, overseer of the ATLAH Worldwide Missionary Church, believes and I quote, ” Obama has released the homo demons on the black man. 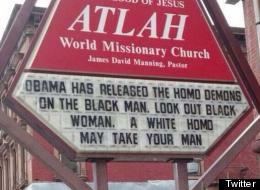 Look out black woman, a white homo may take your man.” Church people kill me with this “homosexual spirit” propaganda. If that is the case, where is this “hetero spirit’? Also, if anyone can take your man, gay or straight, he was never yours in the first place. This is devastating what Obama is doing to the black man and the black woman, and how the white homo is now moving into the black neighborhoods looking for black men that have been converted into homosexuality. But black woman let me say something to you: you have a very hard time competing against a white homosexual male. He’s usually got money — a white homo usually has an American Express card. He usually has an opportunity at the theater — homos love the theater. They love to go out to dinners, parties, they love that kind of a thing… black people need to rise up in mass and recognize the utter destruction that Obama is going in to destroy the black family with these homosexual statements that he has done and release of demons. I’m going on record to say, its hard to compete with anyone that has Black American Express Card regardless of sexual orientation. Also, I have an issue with the Good Reverend making going to the theater, parties, and going to dinner is only a gay thing. Black women don’t like to go out to eat or nah? Are black people only suppose to watch bootleg movies they get from the barbershop? Now if any black woman is foolish to believe this nonsense, girlfriend you deserve to be single and bitter until the world ends. Also, I say to all churches who are against homosexuality, you do realize selling rib plates to raise money for that building fund is against God’s word too? I’ll pray that swine spirit out of you. This entry was posted in Get Your Cousins, Oh Hell Naw!, Strictly 4 The Kidz and tagged black women, homophobia, LGBT, religion, youtube by JimmieValentino. Bookmark the permalink. ← Previous Previous post: Mathew Knowles Not Paying His Child Support Bills?